Boot pack up the Knife Ridge and along an airy walkway, pick the heart-dropping chute of choice, cut into the trees, and sometimes you’ll find powder for days. Wolf Creek resort calls it “low density skiing.” Indeed, sometimes you only know there are other skiers on the mountain by the far-off whoops they emit as they, too, cruise through pow. Wolf Creek is a bit of an anomaly in Colorado. There are the unconsolidated runs and a weather pattern that delivers 430 inches a year. But there’s more: Management won’t sign on to either the Epic or Ikon pass camps. Lift tickets sell for well under $100 and lunch goes for so little it’s possible to skate under the credit card minimum charge. It’s still a little rustic, as the base lodge attests, and rural, as the 20-mile drive from the closest town and conifer views from its ridgelines reaffirm. But this isolated vibe may change. break ground on a base village built around the backside chairlifts that could accommodate up to 8,000 guests. The proposed area currently has just two chair-lift loading areas, a composting toilet and a burger stand with outdoor seating. Environmental groups have sued to stop the development, concerned that lodging, roads, restaurants and shops would destroy wetlands, disturb threatened Canada lynx, and imperil part of the Rio Grande’s headwaters. They say—and judges have agreed—that environmental reviews here were woefully inadequate. But Clint Jones, president of The Village at Wolf Creek LLC, says the development company has cleared the environmental assessments. He argues the federal government can’t limit what a private property owner does with his land. He’s also worked with Davey Pitcher, president and CEO of Wolf Creek, to craft a plan as unique as this mountain. To him, the question is not whether it’ll happen, but when. Since the 1980s, the Leavell-McCombs Joint Venture, now led by Texas billionaire B.J. “Red” McCombs, has mapped variations on a theme for the Village at Wolf Creek. One big plan is currently in play. It calls for up to 1,900 rooms spread over hotel, condos, cabins, and chalets with 220,000 square feet of commercial space, including a restaurant and sport shop. Even with just the first 500 rooms built, developers project that the number of skiers visiting Wolf Creek will skyrocket from the roughly 200,000 it averages now—and as it has since the 1980s—to 500,000. Advancing this vision hinges on a Forest Service decision that seeks to address the property’s longstanding access issues. Public national forest land and the ski area itself surround the developer’s 300 acres, which can be accessed only by an unplowed, dirt road. To move the plan forward, The Village at Wolf Creek LLC came up with two solutions to the address access problem. The first was a proposed land swap with the Forest Service that would shift the development toward Highway 160 and away from skiable terrain and nearby wetlands. The vision built around the land swap would have built up a base area hotel ringed by chalets and yurts tucked into the trees that guests ski out of and ride village chairlifts back to. Concept images showed lots of wood and glass, high ceilings, fire pits, and glamping at its finest. Jones wanted to move in this direction—swap the land and move the development—and the Forest Service approved the plan in 2015. But four environmental groups effectively stopped the deal, winning a 2016 lawsuit. McCombs lost a 2017 request to reconsider that decision and the Tenth Circuit court ruled against the developer and with the environmentalists again in December. Among the concerns listed by environmentalists, however, was a key wildlife corridor, according to Tehri Parker, executive director of Rocky Mountain Wild, one of the plaintiffs in the lawsuit against the development. 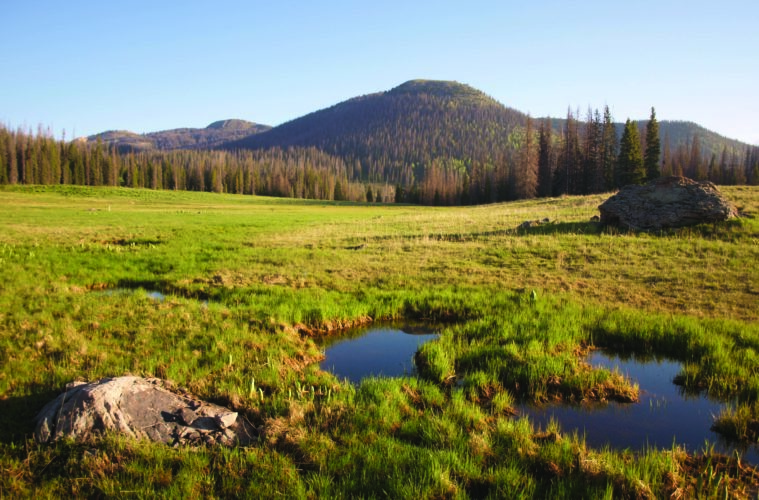 While the Forest Service’s review did examine the effects of swapping acres, it did not consider the environmental footprint of the development itself. That task was left to other state and county officials. But the loss of the land swap won’t stop McCombs plans for development. “This side of the hill is hungry, and almost desperate at times for this,” says Dusty Hicks, local project manager for Leavell-McCombs. His family has owned a ski shop in South Fork since 1980, and he says the San Luis Valley has two solid exports: agricultural produce, and young people, who leave to find jobs elsewhere. In this village, he says, he sees “an influx of money with a clean industry, and that’s what I love.” And all the lawsuits achieve, he says, is to drive up the final price of buying in. The company’s original acreage stretches halfway up the Alberta Chairlift. Instead of scattered in the trees away from the ski area, houses could be in the clusters of pines on the hill, as far up as small plateaus below the Waterfall area, all on private land. In November, Rio Grande Forest Supervisor Dan Dallas issued a draft decision echoing McCombs’ view that because the judge’s ruling took issue with parts of the environmental study, but not all of it, the portion that applied to the road could permit its construction. He set a January 2019 deadline and the condition that the Fish and Wildlife Service needs to review whether Canada lynx, classified as threatened on the endangered species list, will be affected. Little has changed since the Fish and Wildlife Service last issued an opinion on this development in 2005, says Kurt Broderdorp, fish and wildlife biologist with the service. He determined that more Canada lynx will be hit on busier highways and humans will disrupt them in a core habitat area as a result of the project. But ultimately, the project did not cross the line for concern, which is set at jeopardizing the continued existence of species nationwide. Attorneys working the case have questioned whether the Alaska National Interest Lands Conservation Act applies in the lower 48 or essentially runs in reverse this way. The act was crafted for private landowners who found themselves surrounded by public land when Alaska became a state in 1959. But the acres of the Village at Wolf Creek were bought as an island within a national forest—with a summer-only dirt road for access. His suspicion is that McCombs’ endgame isn’t about building a new winter wonderland, it’s about securing and then selling development rights. That the developer says market demands will dictate growth—with no upper limit on that—is, he says, evidence of that. The thing is, whether you’re looking at Wolf Creek Pass and seeing untracked snow, or glades that quietly allow lynx to prowl for snowshoe hare, or the headwaters for farms downstream or a basin that could host a ski-in village like no other in the state, what you see there feels limitless in its potential.